Social Media Marketing World takes place in beautiful San Diego, CA this Wednesday, February 28 to March 2, 2018, and our CEO Jon Ferrara and I can’t wait to attend this year! This event is known for its high-quality content, networking events and peer-to-peer networking with thousands of the best social media and marketing experts in the world. We’re excited to see that so many people in our community are attending, and we naturally want to meet up with as many of them as possible. There’s nothing more powerful than meeting people face-to-face, especially people that you’ve previously only communicated with digitally! There’s a lot of people we want to thank, connections we hope to make, and workshops and keynotes we want to attend, so our event preparation requires careful planning, despite the fact we are not an official sponsor. Here’s how Jon and I are getting prepared to make the most of #SMMW. We’re more than happy to share our process with you so you can use it for yourself. It’s probably not a big surprise that we’re using our own product – Nimble – to come up to speed about our friends, discover common interests among would be contacts, and prepare for meetings. During the show, you’ll see us looking up Nimble profiles on the fly from our mobile device, scanning business cards, sending templated email follow ups, and setting follow up tasks and reminders to follow through on our promises. Social Media Marketing World makes it easy to find out who is speaking at the conference this year and how to connect with other like-minded marketers that are attending. To find a list of this year’s speakers, head over to Social Media Examiner’s Twitter profile, click on their Twitter lists and then click on the very first list called SMMW18 Speakers. To find out who’s attending, browse some of the attendee groups on Facebook or LinkedIn or simply follow the hashtag #SMMW18 on Twitter! For some time, smart networkers like Carlos Gil or Jo Saunders have been using the #SMMW18 hashtag to connect with people they know as well as prospect new relationships. 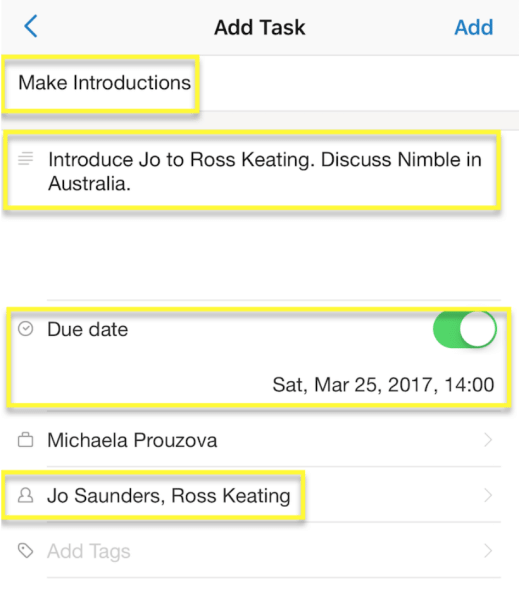 Using Nimble, we import the speaker’s list into Nimble with one click. This year, there are 174 speakers, which is a lot of people to potentially meet, so you may prefer to upload a subset of people. We also use our browser extension (Smart Contacts App), to hover over the names of attendees to qualify and learn more about them. 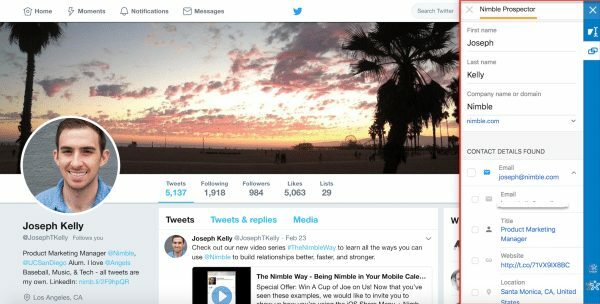 Once they’re in Nimble, sort based on titles, interests, Klout scores, birthdays, geography or whatever else is important to you to prioritize whom you want to meet. Once you’ve got your list, follow them on Twitter, look up their interests and areas of influence using Nimble, and walk in their digital footprint to identify grounds for engagement. Once you have already popped up in their feed several times, it might be a good time to send a personalized LinkedIn invite and connect with them on another platform as well. Don’t rush to a meeting. Take some more time to engage with their content and with them first. Because prospects pour in from social media, use Nimble Prospector to quickly discover their verified emails, phone numbers, and address details. 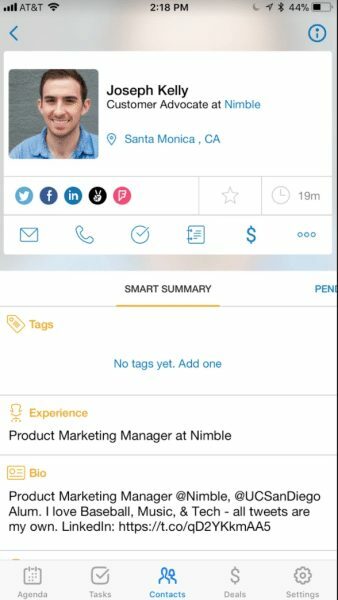 Nimble enriches people and companies with segmentable information like areas of influence to enable outreach. Our Group Messaging feature is unique to other systems in that it allows you to send personalized messages from your own email identity to any of your contacts. This makes each outreach appear as a sincere one-to-one conversation rather than a mass email blast. We also have an awesome reports dashboard to help you see your open rates, who opened your email, how many times someone opened it, and how many times they clicked on the links included in your email. Download our Android or iPhone app and add everybody you interact with. Now you can go to every meeting prepared with your history of email and Twitter engagement directly from your mobile calendar, email and contact apps. Meet someone new? Simply type in their name and watch how Nimble builds enriched record for you by searching the web for all their social profiles. After the meeting, our iPhone app allows you to easily create new contacts by scanning them! You can also create contacts manually by simply typing person’s name and last name and watching Nimble build rich records for you in seconds! Creating tasks can help you make sure that you always follow-up on your promises. 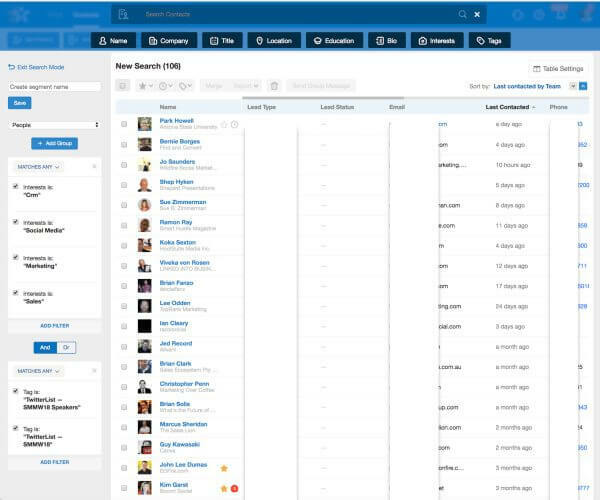 More on managing tasks inside of Nimble here. No worries! Some conferences like Social Media Marketing World offer virtual tickets which allow you to listen and watch all the recorded session. You will even gain access to a private LinkedIn networking group where you get the chance to connect with peers, help out others and ask questions. If purchasing a virtual ticket is not an option, you can always follow the conference hashtag online and look for learning opportunities. People love to share their experience from conferences. It’s easy to just pull out your phone and take a picture of the presenter and their slides or tweet their quote. Using the conference’s hashtag makes it easy to follow the conversations. Since Social Media Marketing World is starting Wednesday, feel free to follow #SMMW18. Here’s why it might be beneficial to you to keep an eye on what industry experts and other attendees are sharing and saying about the conference. Sometimes hundreds of people are talking about a conference hashtag at the same time, which gives you an amazing opportunity to jump in and meet new people from the industry. No matter if you are attending in person or following from home, you will see many of your peers sharing their experiences from the conference. Engage with them and further develop or refresh your relationships with them by engaging with their conference tweets. People love to share what they learn from the keynotes they attended and the slide shares the speakers used. Many times, people will tweet out interesting statistics or finds. We know that we should always be sharing interesting content with our network on social media. Retweeting or re-sharing something that was tweeted during a conference you follow might be a nice way to refresh your feed and bring value to your followers. Conferences are great opportunities for new announcements. Keep an eye on the conference hashtag stream to see what companies and individuals announce and share. Following a conference stream can help you grow your network and learn how other people and companies use social media. Follow those you find interesting and add them to your Twitter list. If you want to “spy” on competitors without them knowing, add them to a private Twitter list without following them ? Engaging with conference goers or others by following remotely can give you a great opportunity to engage before asking for an eventual in-person meeting. We hope you enjoy the conference! 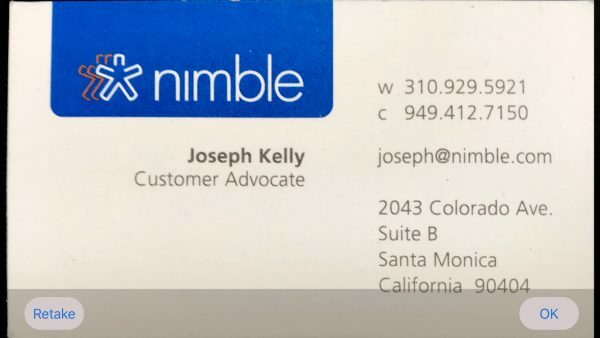 To connect with Jon or me, email us at jferrara@nimble.com or michaela@nimble.com.